Woodpeckers, while beautiful to look at, are not that entertaining to listen to. Why do woodpeckers peck on your house, when there is a perfectly viable tree nearby? Woodpeckers peck for a variety of reasons, but with the proper sonic deterrent device, you can keep them off your home and away from your yard for good! One of the main reasons for large holes is to create a nest or roost hole. If a woodpecker is trying to create a nesting area, the hole will be large and round. These usually are built at the start of their breeding season, which is around April-May. If you find a nest, do not remove it. Do not disturb nests that have already been built for the upcoming season. Wait until after their nesting season ends to remove the nest. The Migratory Bird Treaty Act of 1918 made it illegal to interfere with an “active nest,” protecting over 800 birds in North America. Another reason woodpeckers make holes in the side of your house is to store food. Acorn woodpeckers are a prime example of this behavior; they can peck dozens, sometimes hundreds of holes in homes or trees, storing single acorns in each small hole. Alternatively, they may be pecking because they are looking for food. If this is the case, the holes will be small and asymmetrical. The larvae of certain bees and bugs are especially appetizing to woodpeckers, which may be cause for concern and a call to an exterminator. 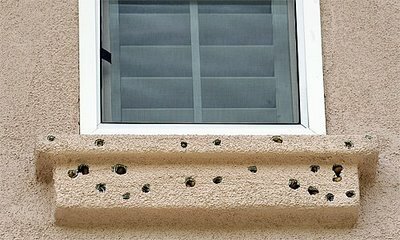 These holes could be a blessing in disguise if they alert the homeowner of a bigger issue like insect infestation. Lastly, woodpeckers may be pecking incessantly on your house because they’re proudly proclaiming “I am woodpecker, hear me roar!” This type of behavior is not done when they are looking for insects. This is a frustratingly loud drumming tap that woodpeckers do to mark their territory and show off before a breeding season begins. Woodpeckers are very stubborn birds, especially when there is a food source nearby. 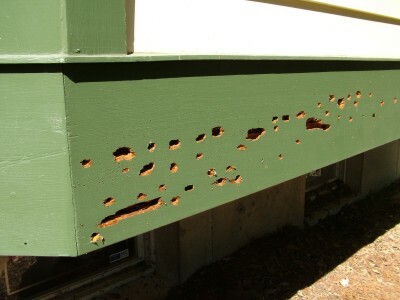 If you suspect the holes were made in search of insects, contact an exterminator to examine the house’s siding for any insect infestation. If it is not an insect-related issue, use sonic technology to rid your yard of woodpeckers for good. The Woodpecker PRO was created specifically for this scenario. It is a small device, a bit smaller than a shoe box, and is weatherproofed so it can be used outdoors. The Woodpecker PRO has 8 different recordings on it, with distress calls from different types of woodpeckers and predator cries from birds of prey like hawks and falcons. With its volume control, you are able to set the volume to mimic the bird calls in your area, so the device does not play too softly or too loudly. If the volume is up too high, the sounds being emitted from the device may sound artificial and fake. This will not scare woodpeckers away. If anything, it would just confuse them. Woodpeckers will hear the recorded distress calls and be alerted of danger in the area. This, followed by a predator cry, enforces that the area is unsafe, and for woodpeckers to stay away. 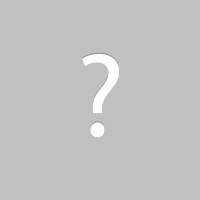 The sounds, as well as the intervals at which the sounds are broadcasted, are completely randomized. This ensures no woodpeckers will acclimate to a pattern of sounds. Woodpecker problems? Not anymore. Outfit your yard with the Woodpecker PRO and stop the holes and headaches – for good!